Fortunately for me, these monsters are made of iron—sheet-metal sculptures by the artist Ricardo Breceda. Fantastical shapes depict serpents and dinosaurs. Urged on by his small daughter, he created dinosaurs, mastodons, great eagles and more. His works are seen in worldwide locations. But Borrego Springs remains the game reserve, corralling the most metal giants in one location. Breceda also has an exhibit of seven sculptures, which recently opened at Alta Vista Botanical Gardens and other sculptures are scattered throughout Southern California. 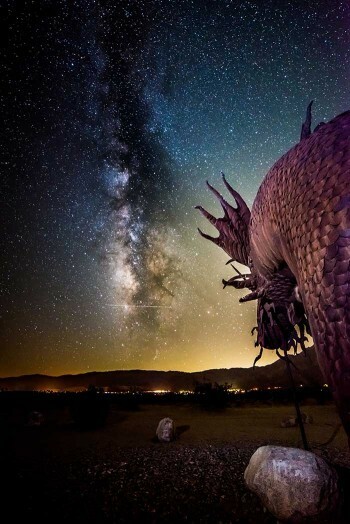 The images from that night in Borrego Springs, California, accompany this article. Getting to Borrego Springs is easy; it's less than two hours from San Diego. It must have rained recently. I drive past stands of ocotillo, usually brown sticks, now dressed in green like proud soldiers. The mesquite and manzanita also add a splash of color to the desert with their flowers. 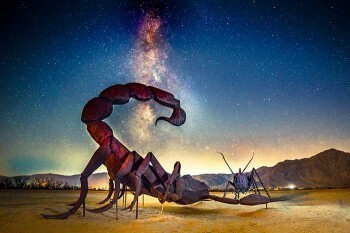 Located halfway between the Salton Sea and Escondido, Borrego Springs is accessible via the 78. A short stop in the gold-mining town of Julian is in order. I pick up breakfast at the Miner’s Diner and Soda Fountain, one of the quaint eateries in town. Carlee’s Place is quite literally an oasis in the desert. There wasn’t much else open. The pickups, motorcycles, and smoking locals parked outside belie the quality of food and service I find inside. A homemade gazpacho brimming with little shrimp and bright with cilantro introduces perfectly cooked grilled shrimp…in the desert! There are several hotels and villas located in Borrego Springs, but I opt for an AirBnB listing. A couple of turns into a residential neighborhood and I arrive at the house. It's a spacious three-bedroom, providing much more room than I need. It's clean and comfortable and has a crystal blue pool. I decide a nap is in order since I left my home in New Jersey at 4 am. I have a lot of work to do at hours when I would normally be sleeping. 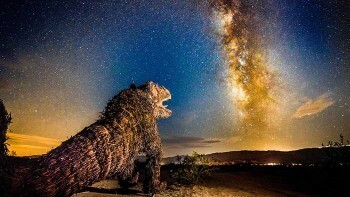 Milky Way photography is a night owl’s beat. On any given trip, I wake up at 11:30 pm, work until 3 am, sleep until check-out at 11 am, and drive six hours to my next location. I use two iPhone apps to help visualize where the Milky Way will be when I get there in the dark. The two apps are Photopills and SkyWalk (available on iTunes Apps. Do not get version 2). These nifty applications give me the ability to see the Milky Way on my phone, align it with the foreground object, and forecast what it will look like at the time of night I will be there. Jim DeLillo is a travel and adventure photographer who specializes in creating transporting imagery that captures local color in travel, editorial, and commercial photography. His expansive landscapes are layered, narrative, and rich in tone. They are lit from within, have a luminous quality, and show a strong attention to detail, composition, and production. His 35+ years of experience includes international publications including Woman’s World Magazine. His photojournalist, reality-based, eclectic style provides a refreshing break from stiffly-posed shots. 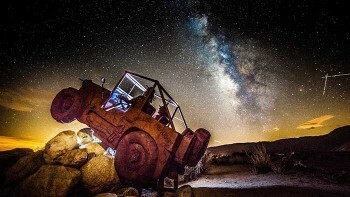 Jim has recently added Milky Way photography to his skill set.